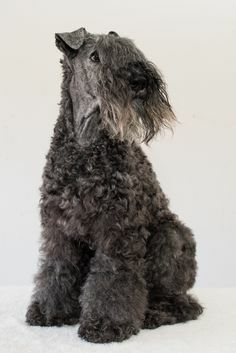 The Kerry Blue Terrier, also known as the Irish Blue Terrier, is a breed of dog.Originally bred to control "vermin" including rats, rabbits, badgers, foxes, otters and hares, over time the Kerry became a general working dog used for a variety of jobs including herding cattle and sheep, and as a guard dog. Today the Kerry has spread around the world as a companion and working dog. 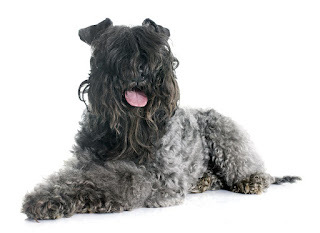 Despite a Kerry Blue winning Crufts,the most important UK dog show, in 2000, it remains an "unfashionable" breed, and is distinctly uncommon; however, it not as threatened as some of the other terrier breeds such as Skye Terrier, Sealyham Terrier, and Dandie Dinmont Terrier. The Kerry Blue Terry is a quick study, though he can be strong willed at times. You'll need a lot of patience and firmness, plus a good sense of humor, when training this breed. The Kerry Blue is friendly to people, but his distaste for other dogs is well known. He can be aggressive and quarrelsome. Owners must be vigilant when taking the Kerry Blue in public. If he's socialized and well trained, he probably won't pick a fight, but he might try to end it if he's taunted. Keeping your Kerry Blue groomed is expensive and, if you do it yourself, it's hard work. Like all terriers, the Kerry Blue can be feisty. He loves to dig, chase, chew, and sometimes bark. This is an active breed. He needs plenty of exercise, every day. A yard to play in is best, combined with daily walks. The Kerry Blue has a long head, dark eyes with a keen expression, small V-shaped ears that fold forward, a squarish body, and a medium-length tail carried up. Coat and color are the Kerry’s defining characteristics. A proper Kerry coat is soft, dense, and wavy in any shade of blue gray, or gray blue. Those shades can range from deep slate to light blue gray, with darker to black areas on the muzzle, head, ears, tail, and feet. Philip Doyle with his dog "Terri" at the Killarney Show,1916. Terrier with or without some Irish Wolfhound or Irish Terrier blood. The extinct Gadhar herding dog is also mentioned as another possible branch of the Kerry's family tree. One certain fact is the breed became very popular as an all-around farm dog in rural Ireland. With the development of dog shows in the late 19th and early 20th centuries, the breed became standardised and "tidied up" for the show ring. The Irish nationalist leader Michael Collins owned a famous Kerry Blue named Convict 224. Collins even made an attempt to have the Kerry blue adopted as the national dog of Ireland. Love of dogs did, however, cross political divides. The first show of the Dublin Irish Blue Terrier club took place outside official curfew hours and was entered both by those fighting for and against an Ireland republic. 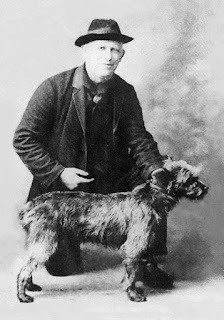 The Dublin Irish Blue Terrier Club was so successful it led directly to the foundation of the Irish Kennel Club, and a Kerry blue was the first dog that club registered. The Kerry Blue Terrier is an energetic and often rambunctious dog who loves to play hard. They are true family dogs who love to be surrounded by the ones they love and insist upon being included in all family activities. They have enough stamina to accompany people on long walks and hikes, but prefer yard games like catch, fetch, or plain old games of tag. Kerry Blues can be trusted around children of all ages, though their yen for rough housing makes them a poor choice for homes with toddlers. They are reliable watchdogs, quick to sound the alarm that someone is approaching, and they are fearless protectors of their property and family. They are not aggressive, however, unless absolutely provoked and are a great choice for families with experience raising dogs. Kerry Blues are good for apartment life. They are fairly active indoors and a small yard will do. The Kerry Blue Terrier is intelligent, but being a typical terrier, he’s also quite stubborn. Being such an observant dog, the Blue will watch to see who is in charge and how they can turn any situation to their advantage. 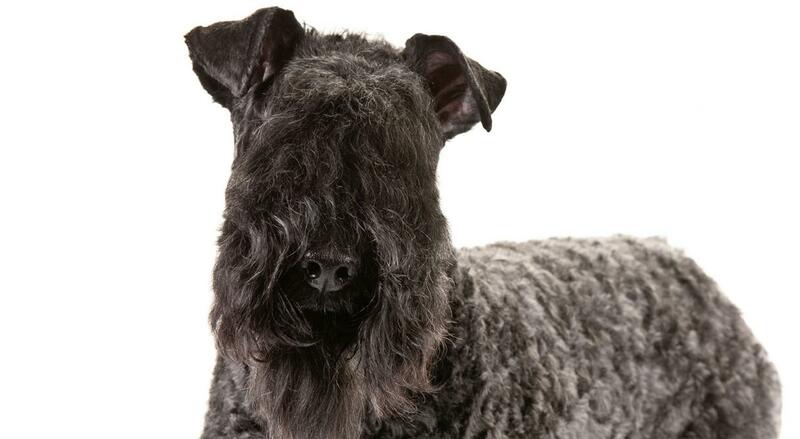 If he senses that you’re not in charge at all times, your Kerry Blue Terrier will gladly take charge. Be consistent and confident when training your Blue and never let him get the upper hand. You’ll find that you’ll make much more progress by using positive training techniques. Come to training prepared with plenty of treats and keep these sessions interesting – your Kerry will lose focus if he gets bored. 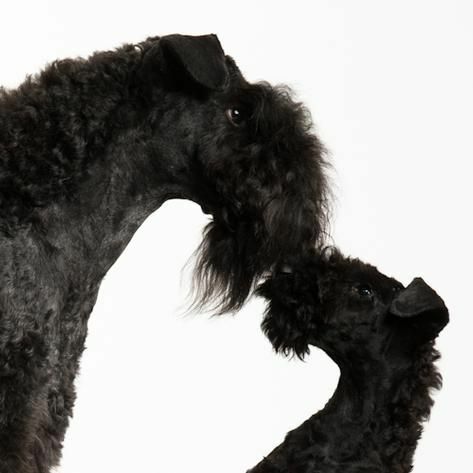 After he masters basic obedience training, your Kerry Blue Terrier is ready to move onto advanced obedience, agility and earthdog training. Because this is an intelligent breed, you need to keep his mind stimulated, otherwise he’ll engage in destructive behaviors. This mid-sized terrier needs a lot of physical and mental activity in order to maintain happiness and health. They have energy to spare, and just when you think you've tired our your Kerry Blue, he'll come back for more. This breed is not for couch potatoes, and don't do well in apartments. Houses with open space and a yard to play in are the ideal living situation for a Kerry Blue Terrier. They need about one hour of vigorous exercise every day which can include brisk walks, jogs, or romping in the yard. In addition to physical activity, it is important to keep the Kerry Blue's mind active. A bored Kerry is a destructive Kerry. Agility training is a good option to work both his mind and his body. Even though the Kerry Blue sheds very little, or not at all, the coat requires daily brushing to prevent tangles, mats, remove dirt and distribute oils. Trimming and bathing need to occur every four to six weeks. 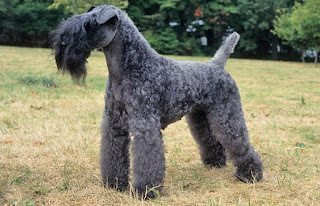 It is recommended that a professional groomer handle the bathing and trimming of a Kerry Blue, but because the breed is not common, it can be difficult to find a groomer who is familiar with the proper Kerry Blue style. Breeders can provide references for groomers. The Kerry Blue loves kids, and because he is a sturdy dog, he can take a few knocks if the play gets rough. He is good-natured, and isn't normally grouchy with children. He is grouchy, even aggressive, with other dogs, though with socialization and training — and altering — this tendency can be minimized. Never let your guard down, though, when the Kerry Blue is around other dogs, especially those unfamiliar to him. The Kerry Blue isn't especially fond of small animals either, given his strong prey drive. His instinct tells him to chase, so keep him leashed in public. The best way to ensure he'll get along with cats or small mammals in his home is to raise him with them and introduce them properly. Following that, close supervision is advised. 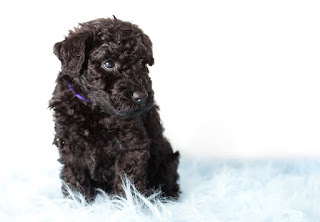 Kerry Blue Terrier puppies are born black. The coat should reach its mature color by the time the dog is 18 months old.